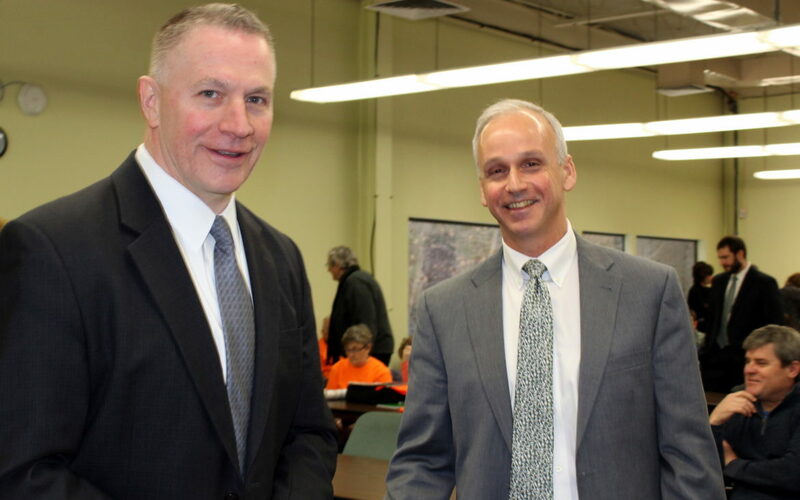 Eversource NH president William Quinlan, left, is pictured with Northern Pass attorney Barry Needleman during one of the deliberative sessions in January 2018 in Concord. CONCORD — Calling the Site Evaluation Committee’s decision to deny Northern Pass’s application a rush to judgement, Eversource’s attorneys say regulators made numerous legal errors in arriving at its decision. The Site Evaluation Committee determined the utility failed to meet it burden of proof that the project would not unduly impact the orderly development of the region, saying company experts on tourism, property values and land use were not credible. The impact on orderly development is one of four criteria regulators must use to determine if a project certificate may be issued. The SEC deliberated on two of the four criteria and found Eversource failed to prove the project would not harm the region’s orderly development. Because of that finding, the committee voted to halt deliberations on the remaining two criteria and deny the project a certificate. However, Eversource has contended regulators should have continued to deliberate as the project’s benefits to the state and proposed conditions and mitigations would outweigh the impact on orderly development. However, many intervenors and the CFP said the benefits would be less and in some areas impossible to determine in the absence of convincing evidence. One major disagreement was over the project’s impact on the forward capacity market, which financially rewards electric generators that agree to supply power in three years to offset concerns about future supply. While the company said it would provide millions of dollars in savings to consumers annually, the SEC found there may be little if any benefit. Glahn said the SEC process has three requirements: consider and weigh all evidence and relevant information; determine if a project’s impact is excessive and requires mitigation or conditions, and determine if a project’s benefits with mitigations and conditions offset the negative impact on orderly development. The company said regulators failed to define or explain what burden of proof would be necessary to satisfy its requirements or where it could be found in law or rules. Glahn called the proceeding a textbook case of arbitrary administrative decision making that violates the law and the company’s due process rights. Eversource asks the court to vacate the SEC’s order and remand the case back with instructions to make all the statutory findings, apply clear standards, consider all evidence and mitigations, and weigh the benefits and impacts of the project. The high-voltage transmission project through the North Country, White Mountains, Lakes Region and Capital area has been controversial since it was first proposed in 2010. Developers agreed to bury about 60 miles of the line, mostly through the White Mountain National Forest, while much of the rest of the line would be in existing utility rights-of-way, although with larger towers. The 192-mile, $1.6 billion project did include a new 32-mile transmission corridor through the state’s most northern communities. Northern Pass was initially chosen for the Massachusetts clean energy project to bring Hydro-Quebec power to the Bay State, but was abandoned in favor of a similar project through Maine after New Hampshire regulators turned down Eversource’s application.